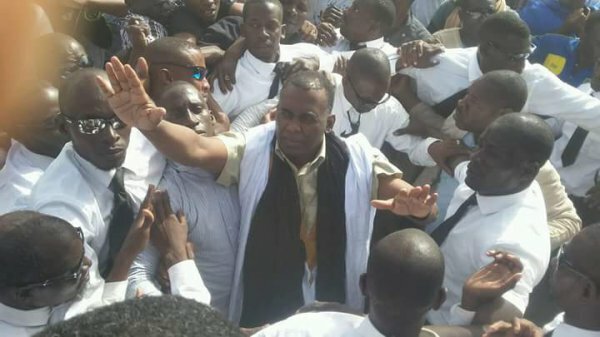 Mauritanian anti-slavery activists Biram Dah Abeid and Brahim Bilal Ramdhane have finally been released from jail after serving 20 months of a 2-year sentence. The Supreme Court has ruled that the facts of their case must be requalified to instead constitute an offense punishable by only one year of imprisonment, and thus on that basis, held that the activists should be released. The activists were arrested in November 2014 during a peaceful anti-slavery march. In January 2015, they were sentenced to two years' imprisonment on charges of 'inciting trouble', 'belonging to an unrecognized organisation', 'leading an unauthorised rally', and 'violence against the police'. The whole judicial process, as thoroughly reported by UNPO, violated several procedural laws and during their detention the two activists were deprived of many rights normally recognised to prisoners. Biram and Brahim, who are President and Vice-President of IRA-Mauritania respectively, have been for years at the forefront of the fight against slavery in Mauritania. Biram has represented the Haratin people of Mauritania in the UNPO Presidency for several years, and he came second in the Mauritanian Presidential election of 2014, behind incumbent president Aziz, only a few months before his arrest. Even behind bars, they have remained committed to their cause, appealing against not only their persecution, but also that of other anti-slavery activists and, more generally, against the government’s dogged refusal to either act to fully implement the provisions that abolished and outlawed slavery or even to recognise that slavery still exists in the country. However, these anti-slavery activists have not been fighting alone. UNPO, as well as a number of other organisations, has remained equally committed to the cause and support of Biram and Brahim. Indeed, since their incarceration UNPO has joined IRA-Mauritania in multiple protests in front of key international institutions, such as the European Commission and Parliament, in order to maintain the momentum of the movement. Among several other initiatives, in December 2015 UNPO, with the support of several organisations, 55 MEPs and over 13,000 private citizens, sent a letter to the EU Special Representative for Foreign Affairs Federica Mogherini, asking her about the EU’s stand on slavery in the country and on the activists’ detention. UNPO is delighted to see Biram and Brahim released and able to reunite with their families. As always, UNPO remains dedicated aiding IRA-Mauritania in its efforts against slavery. While we celebrate the good news, the fight to push the Mauritanian government towards genuinely tackling the problem of slavery will continue to be part of UNPO’s work.